So there I was, reading "A Kid for Two Farthings." It's a long short story by Wolf Mankowitz about a little boy who buys a lame, runt goat in the market, thinking it's a unicorn. It's collected in a paperback volume entitled Espresso Bongo, after a very short short story set in the world of Soho coffee bars. A film was released under the same title starring pop sensation Cliff Richard. Hence the cover. I never liked the story "Espresso Bongo." It's a leap aboard the pop bandwagon, no more and no less. The story about the goat-unicorn, however, is delightful. Rich in local color - the tailor's shop, the tailor's assistant's aspiring wrestling career, scenes from Petticoat Lane and Dalston market, the jellied eel stall, the beigel bakery. It has the breath of an East End I still remember. My mother was a cockney, my father from the east side of London, and although we weren't a Jewish family, we ate pints of prawns from Tubby Isaacs, we visited Petticoat Lane market, we stopped late at night at the twenty-four hour beigel place for beigels and onion rolls. To be from the East End was also, de facto, to be from the Jewish East End. 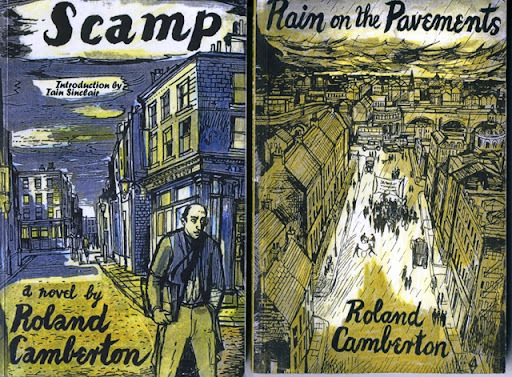 Now the reason I was reading "A Kid for Two Farthings" was that I'd just finished Roland Camberton's second novel, Rain on the Pavements, an evidently autobiographical tale of growing up - and away from - those same East End streets. It had been impossible to read Camberton for years. His only two novels were long out of print, very rare, and nothing was really known about Camberton until novelist and psychogeographer Iain Sinclair indefatigably hunted him down. As Rain suggested, Camberton was a London Jewish novelist, Henry Cohen by birth. His other novel, Scamp, was set in the West End - the world of bohemian letters to which the character in the second novel seeks to escape. Camberton escaped his identity; stepped right out of the East End, out of literature too. He's probably the least well known of a generation of London Jewish novelists and playwrights who briefly held an audience in the years immediately following the war, before being swept away by the Zeitgeist: the angry young men, the beats, pop, and above all television. Of course, this wasn't an exclusively Jewish experience. During the war, and the austerity years which immediately followed, an audience for serious writing briefly blossomed, then faded away. Poets like George Barker, W.S. Graham and David Gascoyne, novelists like Julian McClaren-Ross, became yesterday's news. Of the London Jewish writers, some rode the tiger, moving on to write for TV and the "pictures." After the movie of "Espresso Bongo," Mankowitz went on to write "The Millionairess" (the Peter Sellers and Sophia Loren comedy), an adaptation of "Kid" directed by Carol Reed, "Casino Royale," and several television series. He died in 1998. Alexander Baron made his name with a war novel, From the City, From the Plough, and went on to write two hilarious novels about an East End gambler and chancer, The Low Life and Strip Jack Naked, as well as historical novel set in the East End, King Dido. A long career of adapting classics for BBC TV followed, everything from Ivanhoe to Jane Eyre. He did in 1999. Bernard Kops, author of The World is a Wedding, another autobiography of the Jewish East End and the striving to escape it, became a successful playwright for stage and television. In his eighties, he's still alive. Emanuel Litvinoff wrote his own story too (the only book mentioned here I haven't read), Journey Through a Small Planet. He began with war stories, stuck to the serious novel for the most part, but also wrote some TV plays. He died in September this year, around the time I discovered that Camberton's novels had been reissued by the small UK paperback imprint, Five Leaves - gloriously with the original cover art by Soho painter John Minton. Gerald Kersh is a few years older, and died in 1968, but worth mentioning too. He also wrote his coming of age book, Jews Without Jehovah, and a successful series of war stories. He was always a more cosmopolitan character, a hard-nosed journalist and world traveler. But he shares the wrestling subject with Wolf Mankowitz: it forms the background to Night and the City - a heart-of-London blockbuster, rarely out of print, basis of a remarkable 1950 film noir by Jules Dassin, as well as an unremarkable 1992 remake (wrestling replaced by boxing) starring Robert DeNiro. Night and the City is worth anyone's time to read, but for a blast of North London, try Fowler's End, with its extraordinary monster of a cinema-owner, Sam Yudenow. One thing I've learned is that most writers - even good ones - will be forgotten. All there is to be done is breathe on the embers where we find them.